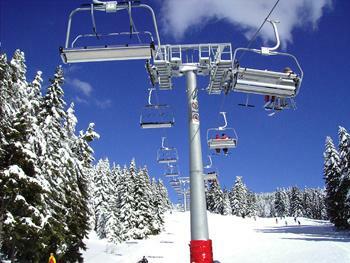 Timberline Ski Resort is North America's first ski area where those who live for the white stuff can play all year long. During the summer, it serves more than 50,000 skiers who come to practice racing techniques or simply want to burn a few runs under the July sun. The resort is one of several on Mt. 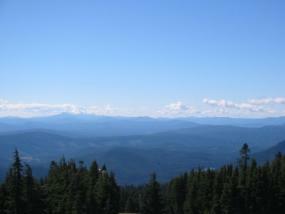 Hood in Oregon, and is located near the top of an 11,245-foot volcano. The Palmer Snowfield, open 12 months of the year, sits at 8,500 feet above sea level, and has the biggest vertical drop in the Northwest. In 2007, Timberline opened Still Creek Basin that includes a new network of challenging trails, a lift-serviced snowshoe and cross-country ski trail, and the Jeff Flood Express, Mt. Hood's longest chairlift. The chair ride lasts a little more than 6 minutes from bottom to top, so skiers and snowboarders can add a few extra runs to their day. At 1,415 acres, Timberline Ski Resort is smaller than your average Colorado or Vermont ski metropolis, but it receives incredible snowfall each year, up to 500 inches, and offers a ton of amenities to woo even the non-skiers of the group. Here are a few fun things to know before you go. Timberline Lodge, declared a National Historic Landmark in 1977, is one of the state's most popular tourist attractions, and this stunning ski lodge is still used to its fullest capacity. Built in 1936 near the top of Oregon's highest mountain during the height of the Great Depression, the lodge was crafted entirely by hand from timbers and rocks found nearby. The builders, unemployed craftspeople hired by the Federal Works Progress Administration, rushed to complete the project because of extreme weather conditions. Fifteen months later President Franklin Roosevelt dedicated the lodge on September 28, 1937. Today the guest rooms pay homage to Northwestern culture with handcrafted furnishings, local artwork, and handmade bedspreads. Prices are amazingly reasonable, ranging from $290 per night during high season to $105 during the summer. While visiting the lodge, you will never go hungry. There are no less than four distinct dining areas, so you can find something to please everyone. Named one of the top 10 mountaintop restaurants in the Western United States and Canada by Sunset magazine, this fine-dining establishment features dishes with ingredients sourced from the Northwest. Located on the second-floor circular balcony of the lodge, this bar is casual, family-friendly and reveals gorgeous views of the mountains. Steeped in tradition and history, the Blue Ox Bar features pub-style pizza and microbrews from Mt. Hood Brewing Company. Need lunch in between ski runs? Jump in line at The Black Iron Grill and Market Cafe for a quick break. For those of you who have had their fair share of hut trip ski adventures… Silcox Hut isn't your average, cold, pot-belly stove experience. Instead, this beautifully appointed rustic retreat, accessed by snowcat, sleeps 24, and your stay includes dinner, breakfast and many more amenities. During the winter and spring months, skiers can hit the slopes out the front door.